Sleep apnea is a common, and usually chronic (meaning that it is ongoing) disorder in which you have shallow breaths (partial blockage) or interruptions in your breathing (complete blockage) during sleep. These pauses in breath can last from a few seconds up to a minute and can occur upwards of 100 times an hour. Typically following an interruption of breathing, a person will come out of their deep level of sleep followed by a loud snort or choking sound and then normal breathing patterns start again. 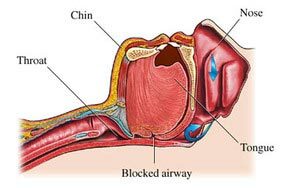 Obstructive sleep apnea: This more common type of sleep apnea is caused by a collapse of soft tissues in the back of the throat (pharynx). This collapse of soft tissue blocks the airway, causing an interruption of breath for a short period of time. When the body reacts to the lack of oxygen, and high carbon dioxide levels, it jolts the body awake to take a quick breath. Factors that have been linked to obstructive sleep apnea include an elongated soft palate, enlarged tonsils, and obesity and weight gain. Central sleep apnea: Central sleep apnea is far less common than obstructive sleep apnea, with fewer than 5 percent of sleep apnea cases. It occurs because the brain doesn’t send proper signals to the muscles that control your breathing — unlike obstructive sleep apnea, in which you can’t breathe normally because of upper airway obstruction. Central sleep apnea may occur as a result of other conditions, such as heart failure and stroke. Sleeping at a high altitude also may cause central sleep apnea. Oral appliance therapy is only a treatment for obstructive sleep apnea. Still, while much research has been conducted and is underway currently, there is no single identifiable cause in every sleep apnea patient. This one minute video demonstrates snoring and Obstructive Sleep Apnea. He is suffering because of the lack of oxygen which causes the brain to send a message to his heart to work harder and increase his blood pressure. Stage One: Transition Sleep: This should account for roughly 5% of total sleep time. Stage Two: Light Sleep: This should account for about 45% of total sleep time. Stage Three/Four: Deep Sleep: This is when the body heals itself and performs many important reparative functions. Ideally, this should account for 25% of total sleep time. People who have a lack of deep sleep tend to be physically tired. REM: Rapid Eye Movement (REM) Sleep: This is where most of your memorable dreaming comes from for the night. REM should also account for about 25% of your sleep time. People that have a lack of REM sleep tend to feel mentally tired and have a difficult time concentrating. It is crucial that we get the necessary amount of deep sleep and REM sleep so that we can live happy, healthy lives. Contact our sleep apnea clinic today! Any condition that may obstruct breathing, such as hypothyroidism, neuromuscular disorders, Down’s Syndrome, etc.